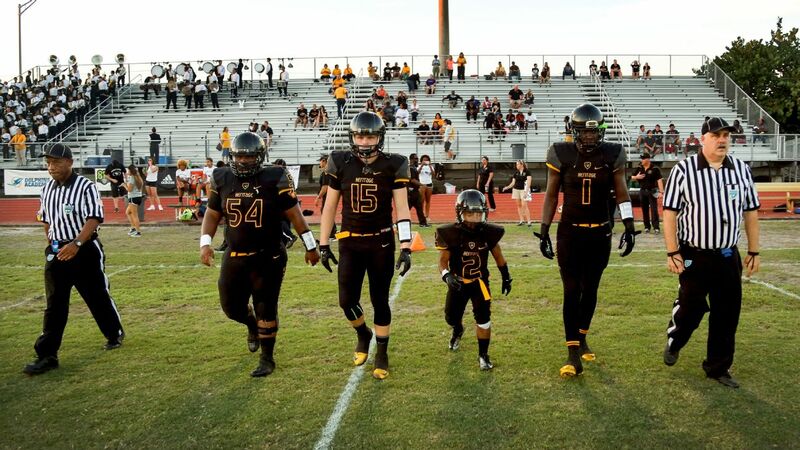 At just 4-foot-5, 95 pounds, running back Adam Reed is showing everyone he can play some serious football at Florida's nationally ranked American Heritage High School. e's always played football," says Adam's mother, Lisa Reed. "He started playing flag football at 5 years old, but it was no big deal back then because there was no tackling. He was always a strong and fast kid, but I never realized how good he was. When he said he wanted to continue playing, I said go for it." The past two years, American Heritage High School in Plantation, Florida, has taken home back-to-back 5A state championships in football. The head coach is a former first-round pick and champion Miami Hurricane, and there are four former NFL players on staff. It's serious football. And it's not for show. Fifth-string running back Adam Reed is 4-foot-5 and weighs just 95 pounds, but he too learned that lesson recently after entering a game and missing a block. Coach Mike Rumph pulled him aside and growled. "If you're going to get in the game, you need to do your job," he said. "This isn't no show." The next game? Adam went up against -- and tattooed -- his man, a 6-foot-2, 250-pound defensive tackle. "I have a soft spot in my heart for stuff like that," Rumph laughed while watching a highlight of the play in his office. "I feel like Coach Rumph understands me more than others," Reed says. "He's always understood how badly I wanted it, and he never doubted me." Reed is used to that doubt. He was 2 days old when Lisa Reed adopted him. She soon realized that he was not growing at the same rate as other babies, so she shuffled him to various doctors and endocrinologists, desperate to find out why her baby wasn't growing. They tried growth hormones, but his body didn't respond the way the family hoped, so they stopped the medication. "I'm not short," Reed says before finding the right words. "I'm small. I'm undersized." None of it has stopped Reed. Last year, doubts crept back into Reed's head when he didn't make the varsity cut, but they were temporary residents of his mind. "When my friends moved up to varsity and I was still on JV, I got discouraged and felt like I did all that work for nothing," he says. "It just made me work harder so the coaches would have to move me up." That work ethic stood out and caught the eye of Rumph, always looking for the next grinder. "I discovered him last summer in the weight room," Rumph says. "He showed me how hard he works. Adam has always been a 10-rep kid, when I ask for 10 reps, he gives me 12. He makes my job easy." Reed has played in four games this year, carrying the ball five times for 13 yards. And it wasn't no show. American Heritage lost its last game of the season to Hallandale High School 27-20 in the regional semifinals and finished with a 9-2 record. Although most of his teammates weigh two or even more than three times his weight, running back Adam Reed doesn't let his stature slow him down on the practice field. "I've always been this height, so I might as well get used to it," Adam says. Fresh off of a 36-21 victory over Miami Norland High School, Reed takes the handoff during practice from quarterback Zack Rinker and runs his route. Center Justice Silver, at 5-foot-11 and 280 pounds, is one of Adam's biggest fans, Rumph says. "He's always telling me: Come on, Coach, put Adam in; I've got his back." During practice, Reed looks over the playbook attached to his forearm. "He's very coachable; he doesn't just get in the game, he gets in the play," Rumph says. "Some kids you have to tell them the same thing over and over again. Not Adam -- he's one of those kids that learns the first time you tell him something." The late-afternoon sun forms long shadows on the field as Reed and his teammates wrap up a practice in preparation for their next opponent, Fort Lauderdale's Stranahan High School. "He's been at American Heritage since third grade, so to his teammates, he's just another kid on the football team," says Reed's mom, Lisa. I would love to have him on my coaching staff one day. Who better to coach and teach someone to never give up than someone who's been doing it his whole life?" Defensive end Andrew Chatfield playfully shadowboxes with Reed at the end of practice. Rumph says that his players tease each other just like in any other locker room, and that Adam can dish it out as well as he can take it. "We jones everybody every day, and he's no different," Rumph says. "When we run reps, players tell him that he has to take 50 steps when they take 20 steps. It's true, but it's also funny and we all laugh. He takes triple the steps as everyone else, but he doesn't let it slow him down." Quarterback Zack Rinker and running back Adam Reed walk past the school buses after practice and head back to the locker room. "I love being around the intensity of the game; I like the challenge that it gives me," Reed says. "I've loved football ever since I was a kid, I've always wanted to play." Reed and his teammates warm up and go through drills before the game against Stranahan. Running back Khalil Herbert is 5-11, 190 pounds, and he's ranked as one of the top running backs in the country. Here, he sits in the locker room with Reed as they collect their thoughts and wait for the game to start against Hallandale High School. "I don't ever count Adam out," Rumph says. "I would love to have him on my coaching staff one day. Who better to coach and teach someone to never give up than someone who's been doing it his whole life?" I feel like I have to do more than most people, and I can't settle for anything less. But I don't feel like I have to prove myself to anyone else." Players gather together after warm-ups as they prepare for kickoff against Stranahan High School. Lisa says that Reed is "busy filling out college applications. I'm not sure what he wants to do, but I'm sure in some way he'll be involved with football. He lives for football." As far as his college prospects are concerned, Reed doubts he'll get any football offers. "I'd like to, of course, but I understand if I don't," he says. Before the game against Stranahan, quarterback Zack Rinker goes through plays with Reed and his teammates. Rinker is the backup quarterback and is usually the one running the offense when Reed gets in the game. Adam runs his route past strength and conditioning and running backs coach Mike Smith while going through drills and warm-ups for the game against Stranahan High School. "He never asked for any accommodations because of his size," Lisa says. "It was Coach Rumph who discovered him and said, 'Let's give this kid a chance.'" As the sun sets, Reed and his teammates head to the sideline for the kickoff against Stranahan High School. When asked about the risk Reed faces going up against player two or three times his size, Rumph says: "I know it's a risk with everyone I put in a game. With him, I just see way more of an upside if he gets in a game. He's inspirational to the team and the fans, and he won't let anything hold him back from playing." Defensive end Andrew Chatfield and Reed walk into the locker room as the team prepares for its home game against Hallandale. When he gets in a game, I go crazy jumping and screaming, and honestly my only thought is get to the end zone." Reed and wide receiver Miles Jones head out of the locker room for the kickoff against Hallandale. "Other people get nervous; I don't get nervous," Reed says. "When I get hit, I have muscle to protect myself." As the game against Hallandale wears on, coach Bruce Aven talks with guard Christian Riffle as he ices his knee after tearing his ACL. Defensive tackle Nesta (Jade) Silvera gets ready to go back into the game, and Reed waits patiently with a look of concern. "At the end of the day, I just want my team to win," Reed says. With the clock winding down in the fourth quarter and American Heritage headed toward a solid victory, Reed gets the call and heads to the field. "He knows exactly what to do when he gets in the game," Rumph says. Late in the fourth quarter, Rumph made the call to put Reed into the game. Quarterback Zack Rinker handed the ball off to Reed, and he scrambled for a 3-yard gain. "His teammates step it up when I put Adam in the game," Rumph says. "When he goes in, they act like we just won the Super Bowl, even though it's just one play." Reed and his teammates shake hands with their opponents after defeating the Cardinal Gibbons Chiefs 21-14. "It's not every day you see someone like me doing something like this," Reed says. "If I was in the stands and saw me running with the ball, I'd get excited, too." Reed and guard David Zebersky laugh as they leave the field after a resounding 38-15 victory over Hallandale. "Adam sets an example for the younger players," Rumph says. "They understand that nothing was handed to him and he's worked for everything he's achieved." Reed is hoisted in the air in celebration of his 3-yard run and the win over Hallandale. After the victory over Hallandale, fans congratulate Reed and his teammates as they head into the locker room. If his football playing days come to an end after high school, Reed says that he'd like to stay around the sport and maybe get into coaching.